The MicroMappers platform has come a long way and still has a ways to go. Our vision for MicroMappers is simple: combine human computing (smart crowd-sourcing) with machine computing (artificial intelligence) to filter, fuse and map a variety of different data types such as text, photo, video and satellite/aerial imagery. To do this, we have created a collection of “Clickers” for MicroMappers. Clickers are simply web-based crowdsourcing apps used to make sense of “Big Data”. The “Text Cicker” is used to filter tweets & SMS’s; “Photo Clicker” to filter photos; “Video Clicker” to filter videos and yes the Satellite & Aerial Clickers to filter both satellite and aerial imagery. These are the Data Clickers. We also have a collection of Geo Clickers that digital volunteers use to geo-tag tweets, photos and videos filtered by the Data Clickers. Note that these Geo Clickers auto-matically display the results of the crowdsourced geo-tagging on our MicroMaps like the one below. Thanks to our Artificial Intelligence (AI) engine AIDR, the MicroMappers “Text Clicker” already combines human and machine computing. This means that tweets and text messages can be automatically filtered (classified) after some initial crowdsourced filtering. The filtered tweets are then pushed to the Geo Clickers for geo-tagging purposes. We want to do the same (semi-automation) for photos posted to social media as well as videos; although this is still a very active area of research and development in the field of computer vision. So we are prioritizing our next hybrid human-machine computing efforts on aerial imagery instead. Just like the “Text Clicker” above, we want to semi-automate feature detection in aerial imagery by adding an AI engine to the “Aerial Clicker”. We’ve just starting to explore this with computer vision experts in Switzerland and Canada. Another development we’re eyeing vis-a-vis UAVs is live video streaming. To be sure, UAVs will increasingly be transmitting live video feeds directly to the web. This means we may eventually need to develop a “Streaming Clicker”, which would in some respects resemble our existing “Video Clicker” except that the video would be broadcasting live rather than play back from YouTube, for example. The “Streaming Clicker” is for later, however, or at least until a prospective partner organization approaches us with an immediate and compelling social innovation use-case. In the meantime, my team & I at QCRI will continue to improve our maps (data visualizations) along with the human computing component of the Clickers. The MicroMappers smartphone apps, for example, need more work. We also need to find partners to help us develop apps for tablets like the iPad. In addition, we’re hoping to create a “Translate Clicker” with Translators Without Borders (TWB). The purpose of this Clicker would be to rapidly crowdsource the translation of tweets, text messages, etc. This could open up rather interesting possibilities for machine translation, which is certainly an exciting prospect. Ultimately, we want to have one and only one map to display the data filtered via the Data and Geo Clickers. 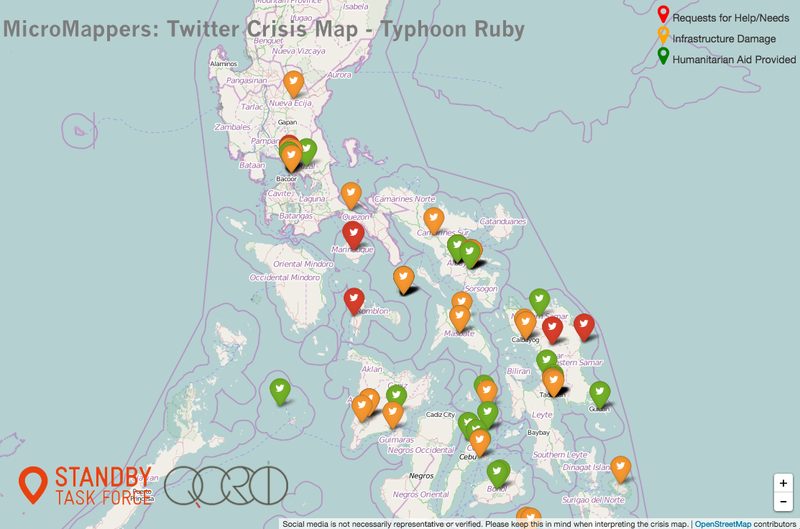 This map, using (Humanitarian) OpenStreetMap as a base layer, would display filtered tweets, SMS’s, photos, videos and relevant features from satellite and UAV imagery. Each data type would simply be a different layer on this fused “Meta-Data Crisis Map”; and end-users would simply turn individual layers on and off as needed. Note also the mainstream news feeds (CNN and BBC) depicted in the above image. 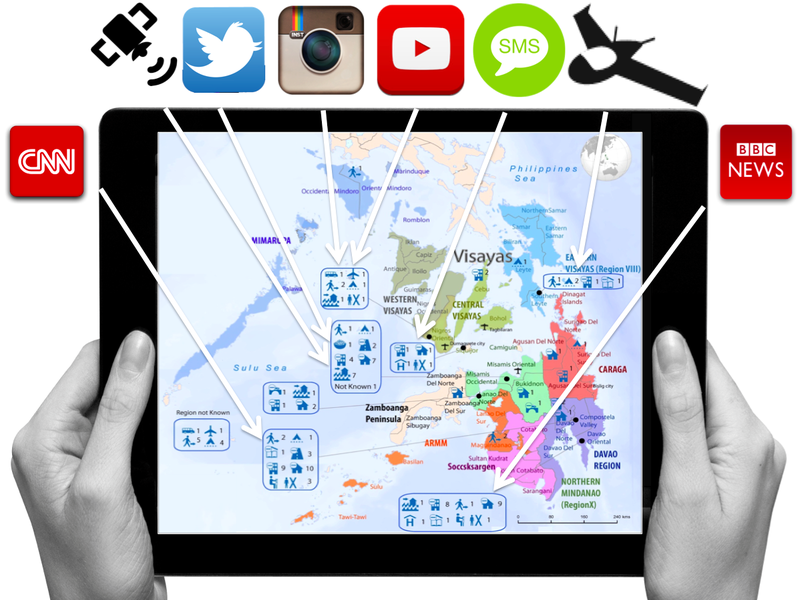 We’re working with our partners at UN/OCHA, GDELT & SBTF to create a “3W Clicker” to complement our MicroMap. As noted in my forthcoming book, GDELT is the ultimate source of data for the world’s digitized news media. The 3Ws refers to Who, What, Where; an important spreadsheet that OCHA puts together and maintains in the aftermath of major disasters to support coordination efforts. In response to Typhoon Ruby in the Philippines, Andrej Verity (OCHA) and I collaborated with Kalev Leetaru from GDELT to explore how the MicroMappers “3W Clicker” might work. 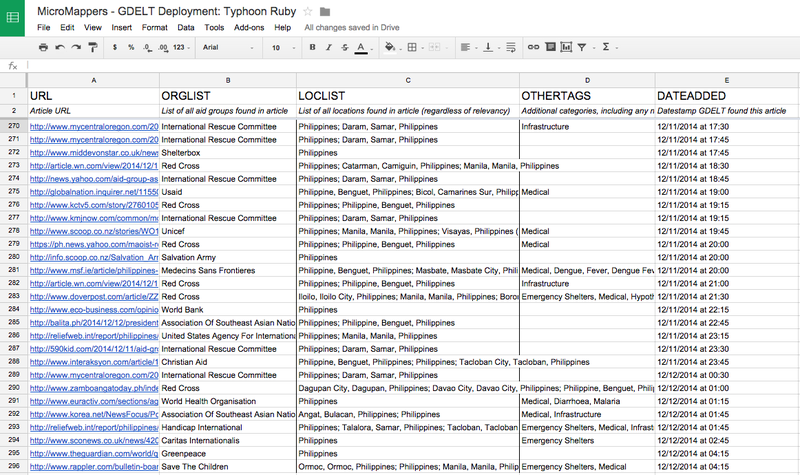 The result is the Google Spreadsheet below (click to enlarge) that is automatically updated every 15 minutes with the latest news reports that refer to one or more humanitarian organizations in the Philippines. GDELT includes the original URL of the news article as well as the list of humanitarian organizations referenced in the article. In addition, GDELT automatically identifies the locations referred to in the articles, key words (tags) and the date of the news article. The spreadsheet below is already live and working. So all we need now is the “3W Clicker” to crowdsource the “What”. The first version of the mock-up we’ve created for the “3W Clicker” is displayed below. Digital volunteers are presented with an interface that includes an news article with the names of humanitarian organizations highlighted in red for easy reference. GDELT auto-populates the URL, the organization name (or names if there are more than one) and the location. Note that both the “Who” & “Where” information can be edited directly by the volunteer incase GDELT’s automated algorithm gets those wrong. The main role of digital volunteers, however, would simply be to identify the “What” by quickly skimming the article. The output of the “3W Clicker” would simply be another MicroMap layer. As per Andrej’s suggestion, the resulting data could also be automatically pushed to another Google Spreadsheet in HXL format. We’re excited about the possibilities and plan to move forward on this sooner rather than later. In addition to GDELT, pulling in feeds from CrisisNET may be worth exploring. I’m also really keen on exploring ways to link up with the Global Disaster Alert & Coordination System (GDACS) as well as GeoFeedia. In the meantime, we’re hoping to pilot our “Satellite Clicker” thanks to recent conversations with Planet Labs and SkyBox Imaging. Overlaying user-generated content such as tweets and images on top of both satellite and aerial imagery can go a long way to helping verify (“ground truth”) social media during disasters and other events. This is evidenced by recent empirical studies such as this one in Germany and this one in the US. On this note, as my QCRI colleague Heather Leson recently pointed out, the above vision for MicroMappers is still missing one important data feed; namely sensors—the Internet of Things. She is absolutely spot on, so we’ll be sure to look for potential pilot projects that would allow us to explore this new data source within MicroMappers. The above vision is a tad ambitious (understatement). We really can’t do this alone. To this end, please do get in touch if you’re interested in joining the team and getting MicroMappers to the next level. Note that MicroMappers is free and open source and in no way limited to disaster response applications. Indeed, we recently used the Aerial Clicker for this wildlife protection project in Namibia. This explains why our friends over at National Geographic have also expressed an interest in potentially piloting the MicroMappers platform for some of their projects. And of course, one need not use all the Clickers for a project, simply the one(s) that make sense. Another advantage of MicroMappers is that the Clickers (and maps) can be deployed very rapidly (since the platform was initially developed for rapid disaster response purposes). In any event, if you’d like to pilot the platform, then do get in touch. This entry was posted in Big Data, Crisis Mapping, Crowdsourcing, Drones/UAVs, Humanitarian Technologies, Satellite Imagery, Social Computing, Social Media and tagged Clickers, MicroMappers, Vision. Bookmark the permalink. Check out this great piece on some big things happening in the digital humanitarian community. Each response is an opportunity to identify our best practices, hone our tools and enhance our capacity. Standby Task Force is honored and excited to be at the forefront of these developments. Have you seen EMM technology used to integrate with location services to track things as they’re being used in these types of deployments? Seems like tools like AirWatch or http://www.bushel.com could be pretty useful in getting the apps that a task force might use to devices and possibly even side loading them data, as with Casper? who in this case would be the end user?